A pair of black Munchkin shoes are sure to take your Wizard of Oz Munchkin costume to the next level. The black satin-like shoes are made of polyester and have a vinyl sole. An elastic band at the ankle keeps them in place and the interior has a foam lining so they keep their shape. The curled toe gives them an authentic Munchkin look. These shoes work well for our adult Munchkin costumes. 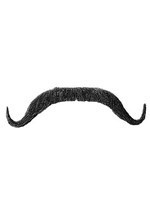 Add a mustache to your Munchkin costume with our spirit gum adhesive and remover.